There are several points to consider before selecting a shade tree for your yard. Following is a list of things to consider. 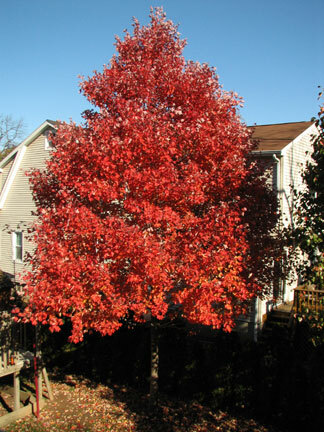 Size – Be sure to look into the full grown size of your shade tree. Will it fit well in the place you want to plant? Location – You want your shade tree to do the most for you in the location you choose. You must also watch out for utilities such as power lines, under ground sewer lines etc. Trees can also be planted to screen out unwanted views. Color – Is the fall color important to you? Many options are available for beautiful fall color. Hardiness – Our shade tree selection is chosen to be resilient in the hardiness zone for mid Missouri which is zones 5-6 (6a in our immediate area). Habit – Does the shade tree have naturally heavy branches or light branches? Will it have deep shade versus light filtered shade? Remember that if you have a beautiful thick lawn, planting a tree that provides a lot of shade, may change the type of grass you need to grow in its shade. Plant Choice – Does the shade tree like wet feet or dry feet? A maple tree will not do well in a wet swale. A cypress tree will not do well in a dry location, etc. Installation – After the location has been selected, the tree will need to be installed. First determine if you will install or if you prefer to have a professional install the tree for you. If you decide to install, determine the soil condition and what type of amendments it will need. Determine the hole size. It is important not to cram the root ball into a tight hole. It is also important to plant the tree at the right depth – not too shallow or too deep. Usually the height of the soil on the tree in the container or root ball is the right height for the soil when planted. Most, if not all, shade trees need to be staked for the first year to reduce the movement of the tree and its roots. Excessive movement of the roots will hinder the development of strong stable roots – not to mention causing it to grow crooked. Maintenance – Procedures for maintaining a tree vary depending on the time of year you plant – fall and spring are the best times. Mid winter and mid summer are not impossible, but not recommended. Always consult a nursery professional to get specific information for maintaining your new shade tree on topics such as pruning, fertilizing, insect control, etc. Our mission at Hillermann’s is to make sure you are happy with your shade tree and get years of enjoyment out of your selection.